Microsoft Word is the professional word processing program first introduced to the masses in 1983. There have been many new releases of Word (Microsoft seem to release a new version every two or three years), the most ground breaking being (arguably) Word 2007. Word 2007 heralded the birth of the much maligned/much misunderstood ribbon. Each new version of Word brings with it new features and functionality. These new features are great - but how do we use them? New functionality invariably helps us complete our tasks more quickly, and with less fuss, but we first have to tackle that learning curve. And that's where word-videos.com comes in. By far the best approach to learning how to use software with a rich graphical user interface is by watching video tutorials and following along in your own Word document. 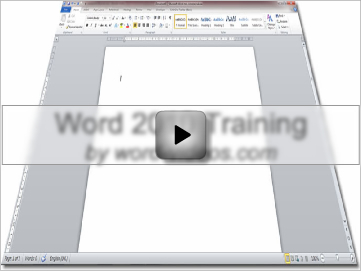 On word-videos.com, we've got tutorials that cover just about every aspect of Microsoft Word. The order in which the tutorials are presented forms a logical sequence: if you follow that sequence, you'll find that the new things you learn refer to knowledge you've already acquired from previous lessons. And, unlike websites such as lynda.com and vtc, our videos are free! Just find the Microsoft Word subject that you're struggling with in the links on the left, go to that page and start watching the video. We do requests too, so if you can think of a Word tutorial that should be on this site but isn't, do let us know. You can do that here on the blog. It was only a matter of time before the next version of Microsoft Word was released - and here it is! Word 2013 is now in widespread use, and it brings with it new features galore. We don't have time here to explore the new version, but if you want some tutorials on Word 2013, check out that link. Our first impression of Office 2013 in general: it's a bit "flat". You'll see what we mean. But hey, love it or hate it, you'll probably be using it soon.